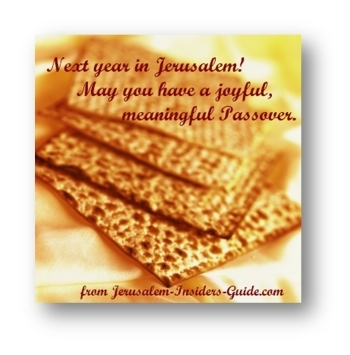 We at Jerusalem-Insiders-Guide.com want to wish you a wonderful and joyful Passover holiday. Passover is March 25 – April 1 this year. The Priestly Blessing will be recited at the Western Wall in Jerusalem on March 28, 2013 during morning services at 9:00 and 10:00 a.m. Need a little inspiration or how-to-help for the Passover Seder? This Passover Resource Center comes to the rescue. 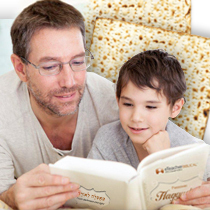 Visit the Jerusalem Insider's Guide aStore to pick up last minute Passover necessities – seder plates, cups and matzah covers. As to the menu, find the perfect Passover cookbook to make your seder gastronomically memorable this year..
By shopping through these links, you also help support our website and show your appreciation for the free information we provide. Thank you! If you haven't yet, you can sell your chometz online here. If you're going to be in Jerusalem next week and the following week, there's lots to keep you busy during Chol Hamo'ed, the intervening days of Passover. First, you might want to download your copy of our Introduction to Jerusalem: A Guide to the Holy City. It's the perfect guidebook for anyone planning a short visit (yes, that's a shameless plug for my own book!). Check out the Open Jerusalem Scavenger Hunts – there are two of them planned during Passover week, so don't miss this opportunity to explore Jerusalem in a hands-on, fun and educational way. No matter how often or how long you've been here, a Jerusalem Scavenger Hunt will make you see our city in a whole new way. To find out more or make reservations, go to our March Events page. There you'll also find out details about the Jerusalem Ice Festival. Ice skating in Jerusalem during Passover – who'd have thought? You might also want to check out some of the kids' activities at the Bible Lands Museum and the Israel Museum. Ir David, the City of David, is always a fascinating place for people of all ages. This is a free service that we consider a privilege to provide. Jewish tradition, however, teaches that prayer and charity, together, have the power to change Divine decrees. So please consider super-charging your prayer with a donation to our charity fund for disabled children in Jerusalem. Your donation, however small, would help provide much needed services, therapy and medications for severely disabled children in Jerusalem, as well as food to help them enjoy the upcoming holiday. Whatever you choose to do and however you choose to celebrate the holiday, may these be days of joy for you and your family. Safe journeys and may we see you soon, here, in Yerushalayim. Your Hebrew lesson of the day: חג שמח Chag Same'ach - in other words: Happy Holiday! Receive your very own Haggadah! Your very own eTeacher Haggadah, with full English translation and transliteration of the Hebrew text. This beautiful gift is waiting for you! Please forward our newsletter to your friends. It is published bimonthly. If you don't want to miss anything in between newsletters, please subscribe to our RSS feed – that means Really Simple Syndication, and it couldn't be simpler. We hope to see you soon in our favorite city. May you have a wonderful holiday!